Corporal Rick Franklin is a model soldier, devoted to his wife and young daughter. While stationed on his country’s restless border, he makes a tragic mistake and becomes a reluctant hero for a president who is soon overthrown. As the country of Ailan balances on the knife-edge of chaos, Rick accepts the help of a former lover to ensure his family’s safety. In doing so, he stumbles across the murderous truth behind the Silk Revolution. It pulls him into the dark heart of the government and a betrayal that cuts him to the core. Set in a future with parallels to life in the 21stcentury, A Father’s Choiceis the prequel to The Misruleseries. 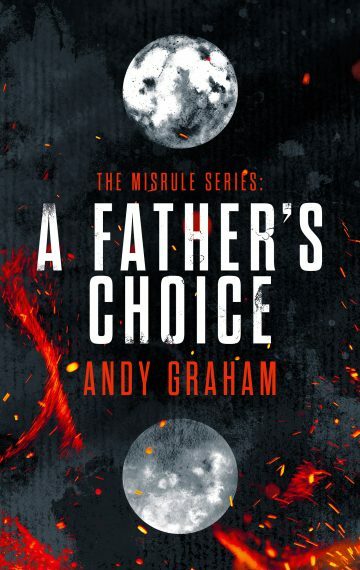 Part political thriller, part dystopian fiction, part tragic love story, it is a compelling, morally ambiguous tale from British author Andy Graham that will appeal to readers who enjoyed books such as Divergent,The Handmaid’s Tale,1984and The Left Hand of Darkness.